The arrival of Christianity during the fifth century AD began a process of change in Ireland. Christianity is a religion of the book and the Irish who became monks learned how to read and write. New bibles needed to be produced for the new monasteries and churches that were springing up all over the island of Ireland. 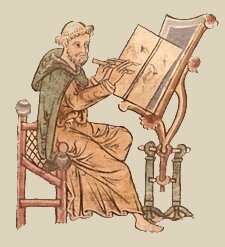 The Irish monastries became famous for producing beautiful handwritten books called Manuscripts. In many cases these books were illustrated with images and patterns, these type of books are called Illuminated Manuscripts. The Cathach dates from the 6th century AD. It is a copy of the psalms in Latin Vulgate ( a type of Latin) and is the oldest Irish manuscript. The title Cathach comes from the word battle in the Irish language and legend has it that the book was carried into battle. It was traditionally attributed to the hand of St. Columba himself but this is no longer believed to be so.
. It is a Psalter or book of Psalms and is written by one scribe in the “Early Majascule” script. Decoration in the manuscript is limited to the Initial Letter at the start of each psalm. The Initial letter is drawn or scripted a very large size and the letters that follow gradually become smaller until they reach normal size again. This technique of calligraphy is called ” Diminuendo”. Some of the script is written in red ink and red dots are used to decorate some of the Initial Letters. 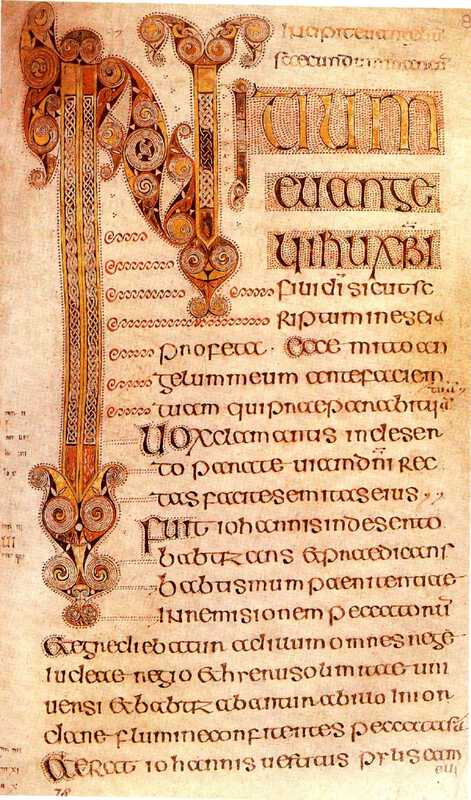 Initial Letters from the Cathach . The “d” is decorated with a fish-tail and a double spiral. 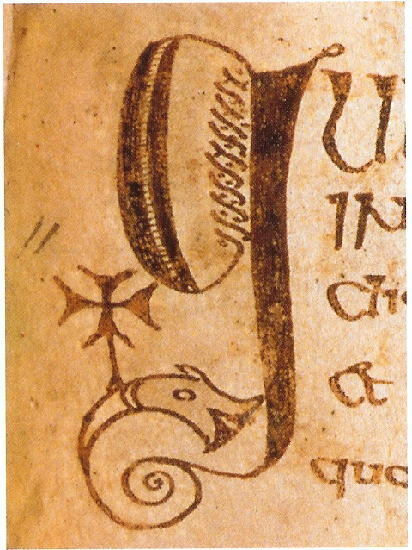 The capital “I” is made into an elaborate scroll. Initial letter ” g”. In this you can see the Initial letters shows a fish or dolphin bearing a cross, a motif familiar in Coptic Egypt. This indicates that these early scribes had contact with lands as far away as Egypt. Image -courtesy if the Royal Irish Academy. You can see the use of Diminuendo – the initial ” G” is very large. The letters that come after it gradually decrease in size until the script returns to normal size. Image -courtesy of the Royal Irish Academy. 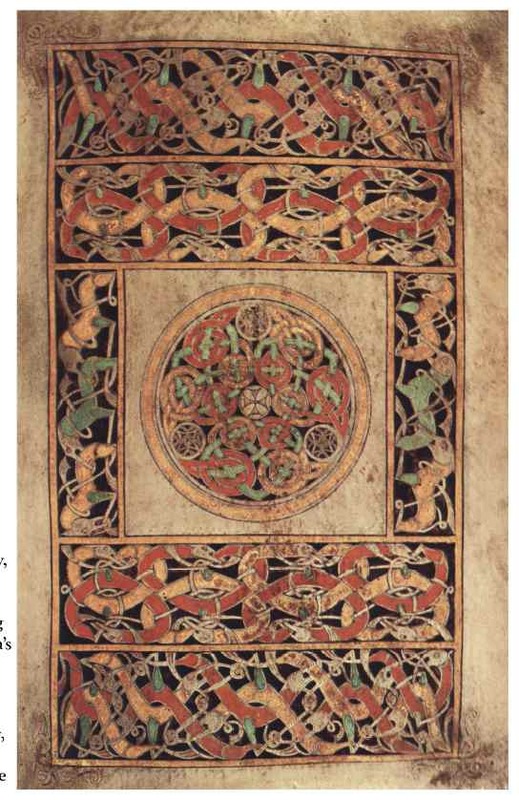 The Book of Durrow dates from the 7th Century AD. It is the oldest illustrated manuscript in Ireland. It is a gospel book containing the four Gospels ( Matthew, Mark, Luke, John) together with the Canon Tables and some prefatory pages. The manuscript is written in Latin Vulgate. 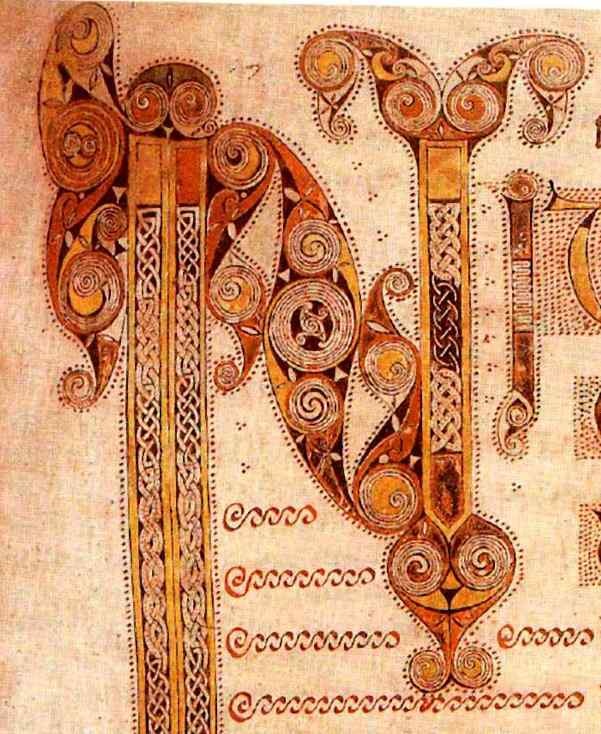 Calligraphy; The calligraphy in the book of Durrow develops the techniques of using large initial capital letters and the “Diminuendo” which was began a century earlier in the Cathach manuscript. In the page shown below- the beginning of the gospel of St Mark, you will see there are different ways in which the scribe used capital letters. Firstly the very large “N” which starts off the Gospel of St Mark text dominates the page and is decorated using spirals and interlace in colored inks of yellow, red and brown. 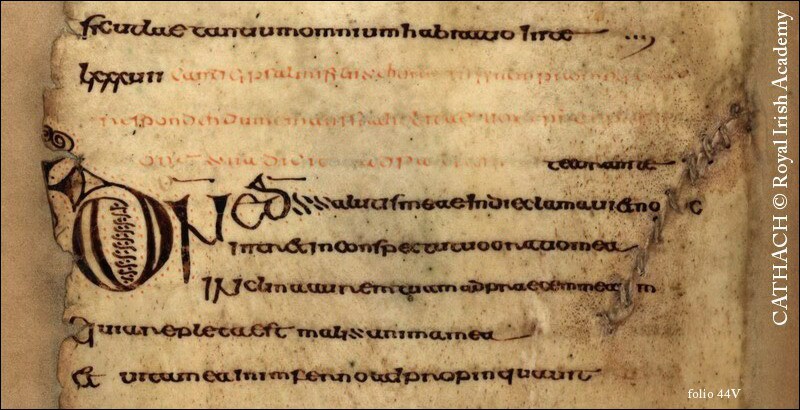 Like in the Cathach, dots are also used to decoate the letter,but now the whole letter is outlined with dots. In the first three lines of text the scribe uses large letters to mark the start of the text of the new gospel. On the body of the text, large Initial Capital letters are used to mark the start of the sentence. The Diminuendo is used in these parts to make the large capitals integrate with the normal body size script. There is a much greater use of the Diminuendo than in the Cathach. Illustration ;The Book of Durrow far exceeds the Cathach in its use of full page illustrations. Each gospel begins with two full page illustrations; a large evangelist symbol on one page and another full page illustration of abstract decoration called a carpet page. 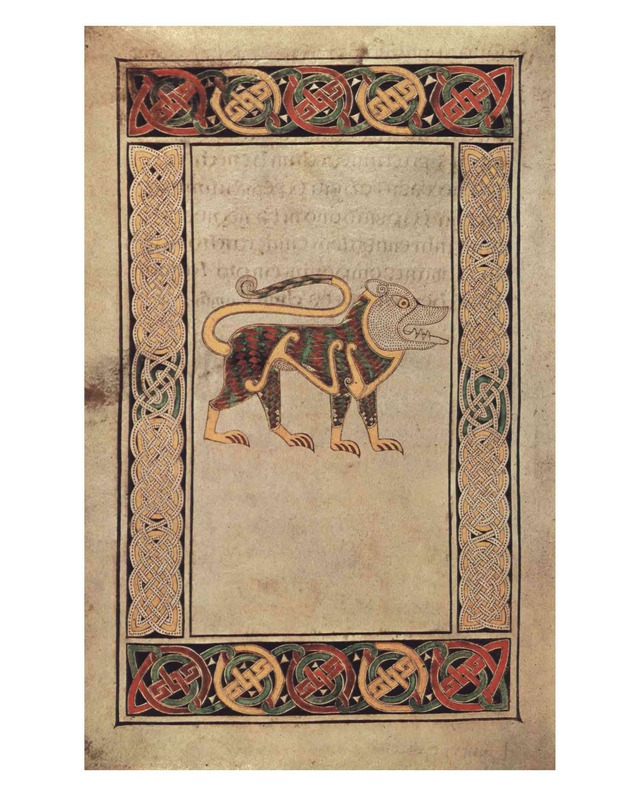 One of the carpet pages called “ The Biting Animals” shows the first example of interlace animals in Irish manuscripts. This page demonstates an influence from Saxon or Germanic Art from either Britain or the continent. Whereas in the Cathach, traces of early Christian Coptic influence could be found in the decoration of letters, a century later when the Book of Durrow was being produced, the scribes were demonstrably being influenced by their pagan neighbours. 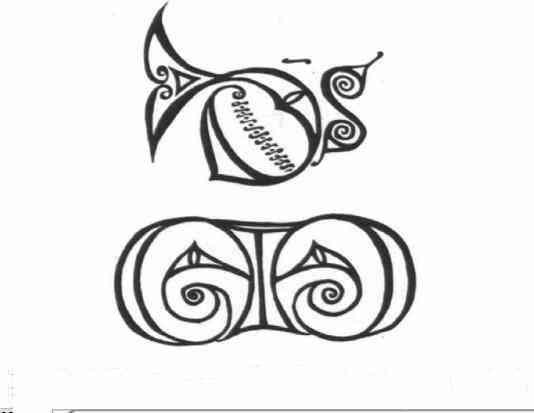 The illustrations in the Book of Durrow show how the celtic use of curvilinear la Tene forms could be merged with art from other cultures to produce a new art style – Early Chrisitan Art (also called Insular Art). The 7th Century Book of Durrow gives us our first glimpse of this new style of fusion between pagan and christian art. Detail of Biting Animals. Here you can see a row of dog-like or four legged animals; each animal is biting the hind quarters of the animal in front. The legs of each animal become a narrow band that interweaves itself around the body of the animal. Detail of Biting Animals. In this detail the long bodies of snake-like or leg less creatures are intertwined with each other and are biting their own tails. It is believed that all the illustrations in the Book of Durrow were made by one hand. The same style of illustration runs throughout the book. Interlace decoration is confined to rectangular borders. There is a use of space in the design of the illustrated pages. A great deal of empty or blank vellum contrasts with the busy decorative borders. The artist here makes a blank rectangle inside the decorative borders. In this blank rectangle, the artist places a central design or symbol. This page style is repeated throughout the book. The artist also used the same style of colour throughout the book. In the decorative borders; the colours used are red, yellow and green on a black background. This makes these colours stand out brightly against the darkness of the black.There is also a strong use of brown or black to outline the four symbols of the evangelists, making them stand out in sharp contrast against the pale colour of the vellum. 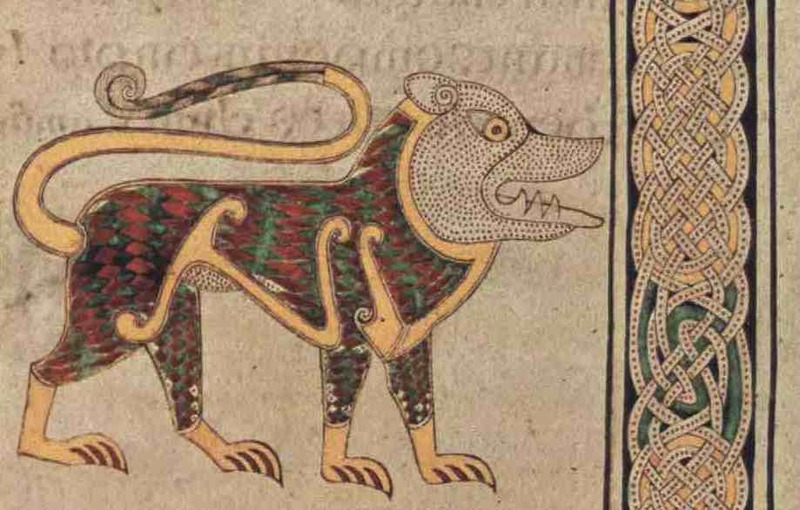 Detail of Lion from the Book of Durrow. It is believed by Art Historians that the lion is influenced by art from the Picts in Scotland. In this detail you can see the use of dots in the face of the Lion and in the interlace pattern. Symbol of a Man : St Matthew; Book of Durrow. 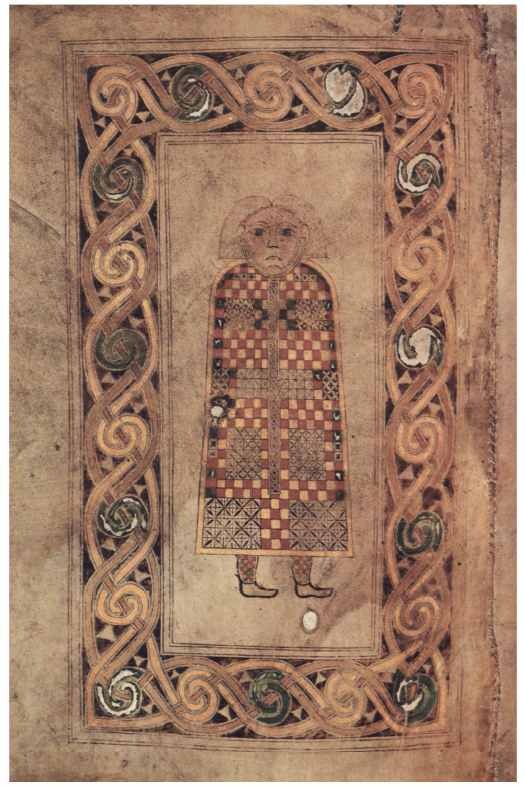 This is the only human figure in the entire book and is one of the earliest Irish Christian representations of a person. The figure is wearing a cloak that covers the entire body except for the head and the feet ( both of which point the same way). The cloak is decorated as if it there was no body underneath it. The decoration is considered similar to metalwork of this time – Millefiori is a technique where different colours of glass are layed side by side to form a pattern. In this case a millefiori of red yellow and black are created on the cloak of St Matthew.